Have you ever looked down and seen a giant, 13 inch brown thing moving through the water? Sounds a bit nasty doesn’t it? Think a slab of mom’s meatloaf with dents in it. 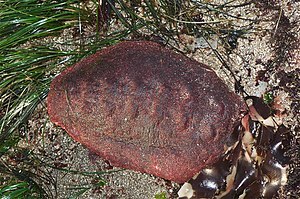 Actually the common name of this shell would be “Gumboot chiton” and it was named for it’s appearance to the rubber sole of boots. The Wikipedia page (link above) says that some people refer to it as the “wandering meatloaf” and looking at this photo, I can see why. It is actually a giant Pacific chiton – pronounced “kite -n” or see here. Chitons are of the class, Polyplacophora and their common name is “sea cradle”. They are composed of eight plates that overlap one another to cover their topside. These are held in place by a girdle that surrounds them, or in some cases, like the gumboot chiton, the girdle covers the plates. Chitons are odd looking and not at all what I think of when I hear the word seashell, but the animal lives only in ocean water but can be found in cold as well as tropical seas. It attaches itself to rocks and can be found on top of them or under them. It’s hard shell plates protect the top, but it can roll into a ball, if it has to, for more complete protection. Although the Gumboot is the largest at 13-14 inches (33 plus cm), chitons can also be less than an inch long and not all of them are brown like a meatloaf. The White Northern Chiton is light colored and the Rough-girdled Chiton has spiky hairs along the girdle. An interesting note about chiton shells is that the plates will come apart once the animal has died and when they wash up on shore you may wonder just what it is you’ve found. The shape of the plates have caused them to sometimes be called “butterfly shells”. Scroll down the page and see some here. The book I own and use for reference is the National Audubon Society Field Guide to Shells. 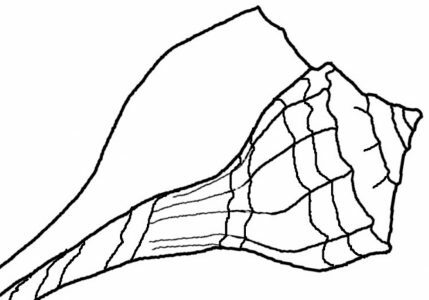 Identify more of your shells at Seashell Identification.